Collecting Newsweek Magazine ranks as you would expect it would–not as popular as collecting old Time Magazines. In fact, except for a brief time in the late 1960’s Newsweek has always trailed Time in terms of popularity and this is no different in terms of collectibility. While vintage issues of Time often used beautiful illustrated portraits of famous or important world figures on their covers, more often than not a copy of Newsweek Magazine from the same date will have a topical photograph of no one in particular gracing their front page. At the same time, if you’re more interested in the contents, that is after all the meat of these magazines, Newsweek presents collectors with a more affordable alternative on an issue to issue basis. There are exceptions, of course. Making their early story all the more interesting, Newsweek Magazine’s founder, an Englishman named Thomas J.C. Martyn, actually was Time’s highest paid staff member when he was hired by them as foreign news editor in 1923. The Oxford graduate and World War I R.A.F. veteran worked for Henry Luce and Briton Hadden until his resignation in 1925. After that he worked for the New York Times for a few years until departing to work on his own idea for a news magazine. The first issue of Martyn’s News-week would be dated February 17, 1933. News-week was created as an alternative to Time, which had managed to alienate many readers who did crave what it ideally offered but were often turned off by either their Time-style of writing or obvious right-wing political leanings. Martyn’s prospectus, as summarized in The Magazine in America: 1741-1990, explained “‘some people feel Time is too inaccurate, too superficial, too flippant and imitative.’ The magazine he proposed to establish would be ‘written in simple, unaffected English [in] a more significant format [with] a fundamentally sober attitude on all matters involving taste and ethics'” (Tebbel 173). Still Martyn personally sent Luce a copy of the debut issue to which Luce replied wishing him the best of luck. 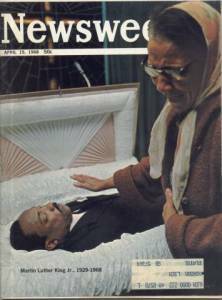 The first issues of News-week Magazine were issued with what I consider to be wonderfully original covers–each issue had seven photos on the front cover, one photograph representing an event from each day of the previous week. As neat as the idea sounds it proved too confusing for readers and was abandoned after about a year. News-week would be unprofitable its first four years in print and cost Martyn the entire amount ($2.25 million) that he had collected from investors at its founding. This led to Martyn selling his interests in the magazine in 1937 when News-week was combined with a New Deal publication titled Today. Vincent Astor became President of the new company and Malcolm Muir became new editor-in-chief of News-week which at that time dropped the hyphen from its name to become the more familiar Newsweek. Under Astor Newsweek Magazine received injections of money every so often, but still floundered behind Time. According to Tebbel, Newsweek “had no particular approach to the news except to digest it, yet it was cast in roughly the same format as Time, with the same kind of departmentalization” (173). In fact it seemed that Newsweek owed a good deal of its success to simply not being Time. That being said, it did always manage to keep U.S. News and World Report at the bottom of the top trio of news magazines and by 1962 Newsweek did report a profit for the twentieth straight year (“A History of”), so it’s not as though we are discussing a failed publication by any means here–once again, it’s just that Newsweek was not Time. It would be under ownership of the Grahams that Newsweek would become the top news magazine for awhile. The Washington Post group was founded in the 1870’s, acquired by the McLean family at the turn of the century and was sold to Eugene Meyer in the 1930’s. 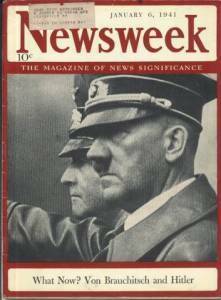 Control would pass to Meyer’s son-in-law, Philip Graham, who would outbid Malcolm Muir to purchase Newsweek Magazine for $8,985,000 in 1961. After Graham committed suicide in 1963 control passed to his wife, also Meyer’s daughter, Katherine Graham (1917-2001), who would pour money into improving the magazine. 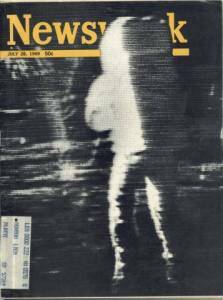 Newsweek distinguished itself from Time during the 1960’s by appealing to younger readers through their presentation of the two big stories of the period: race relations and angst over Vietnam. Also during this decade Newsweek’s Washington reportage would stand out due to Katherine Graham’s personal friendships with both the Kennedy and the Johnson families. Newsweek Magazine had finally found its own voice by moving left of Time, helmed by lifelong Republican Luce, and U.S. News and World Report, published by conservative columnist David Lawrence. Many issues from this period are collectible just by virtue of all of the history occurring at the time. Besides offering coverage of race and war, the 60’s feature quite a few space-related events for which Newsweek Magazine would provide some spectacular covers. Janello and Jones include a chapter in The American Magazine titled “The Telling Anecdote” which includes memories from several publishing figures including Osborn Elliott, Newsweek Magazine editor 1961-69 and 1972-75, who comments upon their famous moon landing cover from July 28, 1969. Elliott recalls being “determined to display on Newsweek’s cover an actual photograph, not just an artist’s rendition, of the first man on the moon” (111). Newsweek had photographers continuously shooting at the images unfolding on television screens in each of their major printing locations, Dayton, Tokyo, and London. In order to make deadline for all editions, Newsweek would end up publishing three similar, but not quite the same, photos on different editions of the magazine. If you’re lucky enough to come across this issue, all three photos are shown and the original story told on an editorial page towards the beginning of the issue. Newsweek magazine would drop back behind Time again as it ran into some instability at the top, going through five editors from 1972-84 before finding stability in Richard Smith, who would stay on until 1998. But if you’re interested in events as recent as that, you’d be better off heading over to Newsweek Magazine’s own site. As far as we’re concerned here, think of Newsweek Magazine as the middle-man, beneath Time and above U.S. News and World Report, in terms of popularity throughout most of their existence and trickling into the same frame of mind for collectors. We want those early issues with the fun seven-photo covers, issues commemorating important events of World War II, covers featuring photographs of famous and historical figures, and issues having to do with space. Otherwise Newsweek Magazine collectors seem confined to those looking for birthday issues and researchers looking for material. Of course, there’s nothing wrong with that! Janello, Amy and Brennon Jones. The American Magazine . New York, Harry N. Abrams, Inc: 1991. Sumner, David E. “A History of Time, Newsweek, and U.S. News & World Report.” Encyclopedia of International Media and Communication. 2003. Academic Press. Ball State University. 5 Nov 2005. (http://www.bsu.edu/web/dsumner/Professional/newsmagazinehistory.htm).